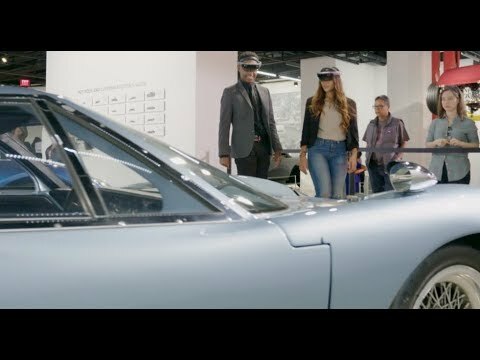 For a shared, untethered mixed reality exhibit, developers at Zengalt built a HoloLens experience so visitors could interact with renowned Ford supercars at the Petersen Automotive Museum. The Ford GT40 is a marvel up close. Built to win the 1966 Le Mans race and beat—among others—the Ferrari 275. At the Petersen Automotive Museum in Los Angeles, an icy blue Ford GT40 sits in a cordoned-off area next to its modern sibling, a 2017 Ford GT. They’re ripe for ogling. For museum-goers to safely experience and interact with the cars firsthand, a mixed reality HoloLens experience was the best solution for museum staff, visitors and developers at Zengalt. Zengalt examined other mixed reality options but ultimately chose HoloLens because it could produce a robust, untethered and shared experience. Because HoloLens is a self-contained device, visitors wearing the headsets are free to walk around the Ford supercars on the museum floor and view them from different angles. When multiple people use devices simultaneously, the start and end of their experiences are synchronized. “With HoloLens, you put it on a person’s head and it just works,” Evdokimov said. Zengalt leveraged UWP and standard APIs to create the HoloLens app that can be controlled by museum staff through a Microsoft Surface Pro 3. By building applications on Windows 10, developers can support multiple hardware platforms with a single code base. This enabled Evdokimov to draw from his skillset in developing apps for Xbox and capitalize on new business opportunities in 3D mixed reality. The 3D An American Supercar experience starts with the hum of an engine, then the museum wall crumbles and the Ford GT40 races into view. The exhibit illustrates the evolution of the GT40, showing the progress of innovation that led to the 2017 model. Visitors see virtual images merge onto the physical cars on the floor. A 3D model of an engine is projected as a hologram to show off its inner workings, and simulated airflow showcases aerodynamic features of the body designs. A leader in developing mixed reality experiences, Zengalt used spatial mapping and sharing to position the mixed reality experience onto real cars and objects within the museum. This approach of combining virtual and real items maximizes immersion for users. In addition, all sounds in the app use spatial sound, giving life to virtual objects with a presence in the real world. For museum staff, Zengalt implemented remote monitoring at the device level. This way, staff have the ability to control the user’s experience, and any commands given through voice or gestures. All users are synchronized in time and see exactly the same experience. Zengalt used its Vyzn platform so it could create the 3D An American Supercar experience without writing a single line of code. Vyzn takes 3D models and turns them into augmented reality experiences. Using this platform, Zengalt created the Petersen Museum experience in just four months. The bulk of the work was done by 3D artists, though developers had to construct features such as custom controls to disable and enable voice and gesture commands. In building Vyzn, Zengalt appreciated the support they received from Microsoft, especially in getting answers and information to build for HoloLens. With a background in developing for UWP, combined with Zengalt’s Vyzn platform, creating a HoloLens experience was only limited by imagination.